On Sunday, October 30, 2018, after the final work on the renovation of the church hall of St. Sava Church in Toronot was completed, the Holy Hiearchical Divine Liturgy was served after which a blessing of the new hall was competed and a fundraiser luncheon was organized. 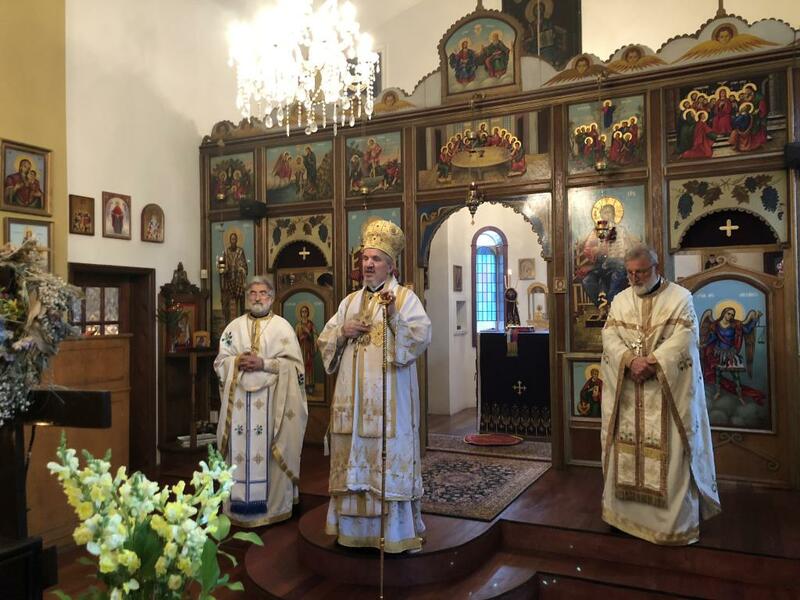 His Grace Bishop Mitrophan of Canada visited the St. Sava Church in Toronto, the "Mother Church" , out of which came a number of other parishes and churches. Our archpastor mentioned in his prayers the parishioners who come every Sunday as well as those who hardly ever come. He mentioned the deceased founders, benefactors, and donors who seventy years ago founded this community as well as those who the following years built the "Serbian home" as they called the auxiliary building under the same roof with the church. His Grace thanked Saint Sava as the protector of this church and parish as well as all the Saints who pray to God. During the homily His Grace reminded us the parishioners that the Apostle Peter listened to the Lord and once more threw his nets in the deep as the Lord commanded and, with His blessing, received that which he himself could not receive. The blessing of obedience is necessary today in order to multiply our virtues which persecuted the prophets. Among other things, our spiritual leader reminded us to always remain with our mother Church, so that we might be directed to good things and our generations to come. At the Divine Liturgy the "Kyr Stefan" Choir beautifully sang the responses while Dragana Stosic sang at the chanter's stand. After distributing the antidora His Grace the bishop blessed the newly renovated hall that was flooded. In the newly blessed hall an agape meal was prepared for about 130 people. The dean of the church, V. Rev. Stavrophor Milovan Sredojevic made a toast greeting first of all His Grace Bishop Mitrophan, thanking him for his care and fatherly love that he has shown towards the Serbian people in Toronto and the entire diocese. Afterward, he thanked the leadership of the hall renovation project Zarko Brestovac as well as the contributors, donors and all those in attendance. Prota the sacrifice of the Kolo Sestara who prepared the lunch together with the families Pejic and Tesic from Kitchener as well as the owners of "Merkator" store in Toronto. He noted that the hard-working members are examples to others to become active in the community. Prota Milovan noted that the roof needs to be repaired immediatley for the worn-out shingles cannot wait for the winter weather. The faithful people are already sending their donations. The final comments were made by Bishop Mitrophan who praised the work that was completed, gifting Zarko Brestovac, the project leader, a beautiful icon of the Most Holy Theotokos. He called on the faithful to attend the divine services and to donate in order to preserve the "house of God' for the church is a mirror of us.